Regency apparel preparation - Regencyish, Regencypunk? 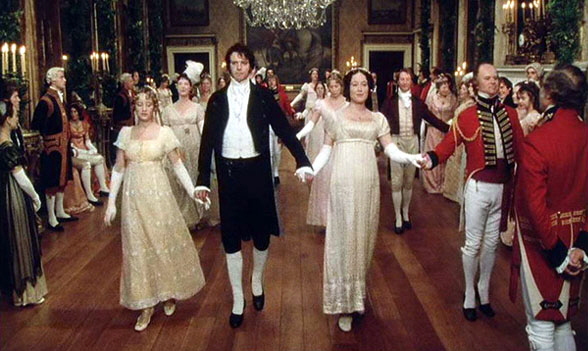 I am preparing for an English country dance ball this Spring. It will be my second and my husband's first (the delightful man provided childcare last year so I might go). I have decided that we should have Regencyish clothes. The ball is wonderfully accepting of varieties of attire. Last year, I saw many authentic-appearing Jane Austen gowns; modern day formal and semi-formal attire; and even some casual wear. 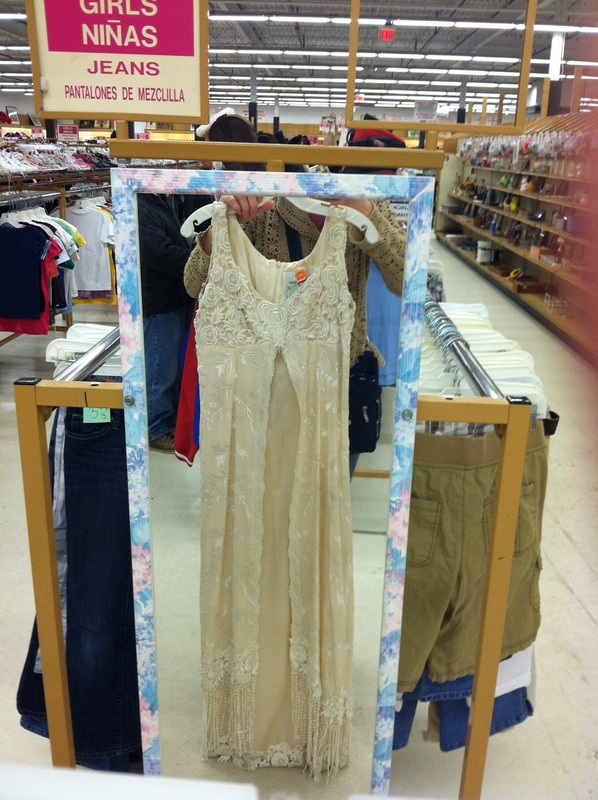 Last year, I wore a gown I found for $8 at a thrift store that I thought had a nice Austen-ish look to it. Thinking it felt like fine fabric (silk) though there was no fabric content label and not recognizing the name, I googled the label and found it for sale on-line. Best thrift store find, ever (at least for me). 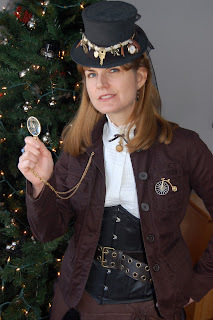 Oh hang it, if there can be Steampunk, I don't know why there can't be Regencypunk. While I'm not punking anything, really, I'm using that as my excuse not to worry much about authenticity. Though I did cut off the fringe at the bottom. I had thought of trying to add some puff sleeves to try to make it a tad more authentic, but didn't have much experience sewing and let it be. This year, I am planning to add puff sleeves and have done a mock up of the sleeves from a Simplicity pattern (Joann fabric stores has sales on Simplicity patterns for $1). It was quite easy as I used an old sheet. I doubt I will have as easy a time with the nearly matching silk slip I plan to use for the actual sleeves. I'm a little concerned that the drapey silk won't add much of a puff but the fabric will do what it does (and I've got a plan for more puff if needed). Worst case, it doesn't work and I go sleeveless again this year. At least I found some awesome opera length white kid leather gloves (for just over $3 - requiring a bit of repair, of course), to lend some authenticity. I will also attempt a more authentic hairstyle. Now, for my very own Mr. Darcy (all the charm and none of the fortune). I am aiming for this look. At a thrift store, I found some black cotton pants and a white tuxedo shirt. My plan is to make the pants into breeches, using this delightful post for inspiration (I'm trying to charm the author into writing a post about his Regency waistcoat) and also consulting a Butterick pattern I have (Joann fabric also sometimes has their Butterick patterns for sale for $1 each). I have ordered a pattern for the Men's 1812 Waistcoat from Rockinghorse Farm. I'm a beginning sewer (maybe advanced beginner...) and I'm feeling fairly confident about making a waistcoat. I helped my daughters with an easy learn to sew vest pattern, so I have some of the concepts. I also hope that this post of a similar Rockinghorse Farm pattern will help me through any confusion I have. Though it is a bit daunting. The cravat will be the easiest part, I think, but will add so much to the look. I am skipping the frockcoat. As delightful as it is, the waistcoat is going to be enough of a stretch for me. While I doubt any gentleman would have removed his coat at a ball, this is where I rest easy in Regencypunk. My Mr. Darcy has an edge and goes into public without a frock coat. Couldn't you just swoon? www.unclimber.blogspot.com. This is my personal blog. Posts labeled preschool, resources and reading lists will have the most useful information. Posts labeled homeschooling tend to be about educational philosophy and can be emotional. You've been warned. If you like my writing but find my unclimber persona a bit abrasive, check out my posts (and those of others) on Life Without School. I was far better behaved over there. Miseducation: Preschoolers at Risk by David Elkind -- this may put you at ease if you are worried about that your child may be left behind by skipping preschool. How Children Fail, Learning All the Time, Teach Your Own by John Holt. How Children Fail is more of an indictment of school and how the system can be harmful to children. LAtT and TYO are more helpful as to how to homeschool. On-line support groups. If you are not are not familiar with yahoo groups, it is easy to sign up for a free account. VaEclecticHS is an especially good group. You can also find local and specialty groups on yahoo. Get Set for Kindergarten Series by Rosemary Wells - these are set in a school environment, but will cover typical preschool subject matter. Placemats - Wal-Mart and K-Mart are good sources, as are toy stores. The public library - you can likely find books on any subject you'd like to study. Befriending the librarians is not a bad idea, either. out of print, but the library may have it. Helping Your Child Learn Math from the Federal Government is similar. Book lists - Chinaberry catalog; Sonlight catalog - the curriculum is Christian but includes many books that are not, click "included items" to see a listing of the books; other search terms to use are "living books", "Charlotte Mason", trivium, classical. "The general assumption in our culture is that children must be taught to read...., Here  are seven principles relevant to the question of how children teach themselves to read without formal instruction." Classical Kids CDs - we've enjoyed introducing our kids to classical music through these. They pair the music with a story; most of the stories follow part of the composer's life in a tale directed at children. One exception is Mozart's Magic Flute, which tells the story of the opera rather than the story of Mozart. My blog has a post listing storybooks exposing young children to the world of art (9/21/2004). Pancakes, Pancakes by Eric Carle -- Jack wants pancakes and he has to cut the wheat, get it milled, get eggs, milk, etc, all the ingredients of pancakes. How to Bake and Apple Pie and See the World by Marjorie Priceman - a trip around the world to get ingredients for an apple pie. Prairie School by Avi. A skillful teacher fosters a desire to learn in her pupil, without forcing lessons on him. Set in the 1880s. Sailing Home told by Gloria Rand. Out of print, unfortunately, but may be available at your library. This is such an interesting story and a beautiful book (the Rands have many books to their credit and I've enjoyed those that I've read). The schooling aspect is that the children learn their basics from their mother; after that, a tutor is hired. I liked the idea that perhaps the tutor wasn't necessary and that structured learning can be tedious while life itself can be far more educational. Abigail Takes the Wheel by Avi. Another sailing book set in the late 1800s. In this one, a girl takes the helm of a steamship boat in New York harbor. There is a brief mention of a test at school, but I felt like this book showed how much more interesting and important real life is than being in school. The Art Lesson by Tomie dePaola. I found this book to be deliciously anti-school, though I'm not sure it was the author's intent (maybe it was and its point is to encourage kids to overcome the obstacles that school presents). The story is about a young Tomie who has to wait until he is in first grade for art lessons at school and then is bitterly disappointed by the lack of artistic freedom the lessons entail. A workable solution is found, but the blaring message I got is that institutional school only pens in your true talents. I wrote this article for The Organization of Virginia Homeschoolers and it appeared in the Summer of 2008. I have four wonderfully soft pima cotton t-shirts from LL Bean in a leaf green color. This is not a color I would normally choose to buy and four t-shirts is a bit many but it was part of my kit for my morris dancing team. When we choose a new color for our kit t-shirt, that left me free to play. 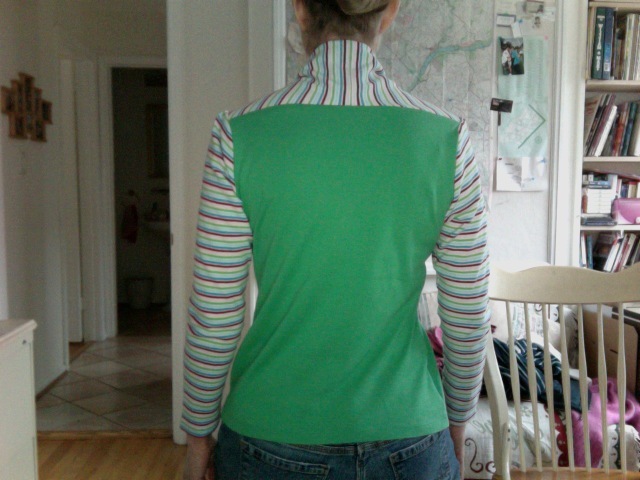 I decided to try the bolero/shrug/shirt pattern again. I found a striped turtleneck at the thrift store that I thought would work well with the green shirt. This time, I was able to follow the yoke pattern and double the material, unlike the single thickness I used on my contrastock t-shirt recon. The torso of the turtleneck was just the right size for the yoke pattern. I used the turtleneck sleeves as they were. I should do something with the leftover neck, maybe I'll make a headband. 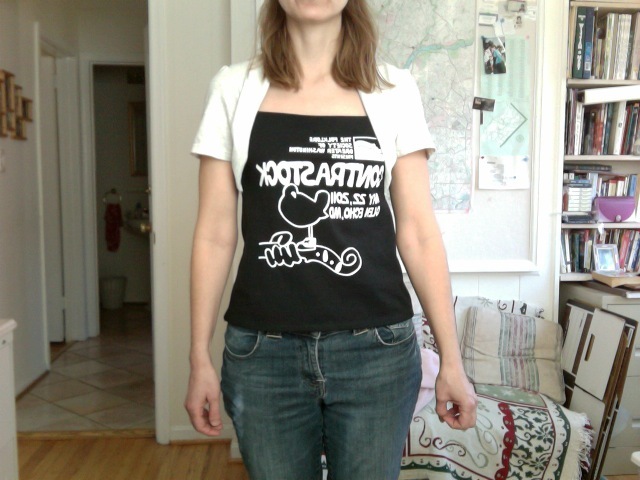 The v-neck was a bit fiddly and I took a trial and error approach to making this. I'm happy with the results, but think next time I'll work on more accuracy with measuring and cutting -- re-sewing the sleeves three times on each side was a bit tiresome. I didn't make any effort to line up the stripes. I've picked up a few t-shirts recently and I've been thinking about reconstructing them. I got this XL Gildan t-shirt last week and thought I should jump in before I'd thought about it too long and ended up with options paralysis. Until recently, most of my sewing had been upcycling/recycling/reconstruction projects. 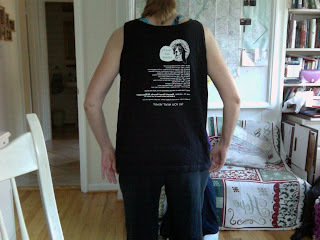 However, my kids recently wanted to make a vest using a Simplicity pattern. My oldest knew how to find the fabric requirements on the back of the package, so I figured that between the two of us, we could figure it out. 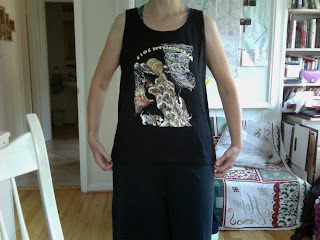 The vests turned out really well and it broke the pattern mystique -- I was no longer frightened of patterns! Seriously, they scared me because if you play around with a recon, there is no way to measure its success or failure; you are simply making art. But a pattern has a built-in metric -- the garment is supposed to look like the picture on the front. You have either succeeded or failed at making the garment. It seems a lot less like playing. Anyway, we love going to Jo-Ann fabric and when they had a sale on Simplicity patterns for $1 each, I stocked up on anything I thought might be useful. I picked patterns because of elements in them that I liked, like drapey sleeves, though I have no intention of ever making the full garment. So, for this recon, I used one of those $1 Simplicity patterns, number 2364, which has a bolero/shrug-like feature. Since this is a reconstruction, I didn't follow the pattern as written but used it as a guide. I did use the pattern pieces for the yoke and the sleeves. I referred to the pattern pieces for the front and back of the top. 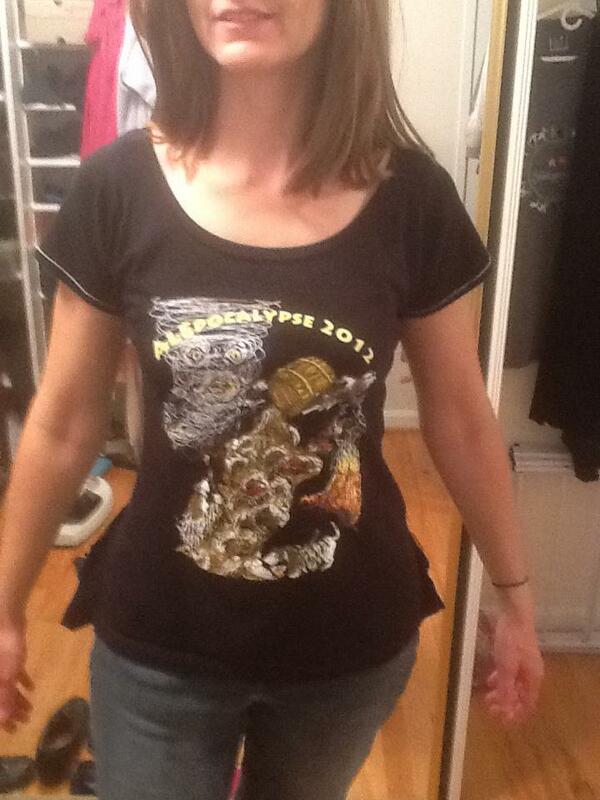 I made a mistake in first altering the top to fit me, like I did in this project. 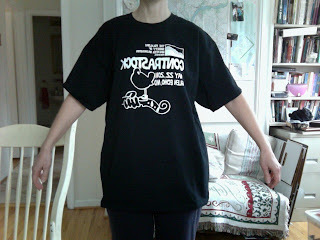 It's very simple, you just lay a well-fitting t-shirt over the big t-shirt, chalk the outline and sew. It was so cute, I was tempted to leave it as it was. However, I'm not a big t-shirt wearer and my last t-shirt recon was also a black t-shirt, so I thought I might try something different. Plus, I was itching to use my Simplicity pattern. Why was it a mistake to fit the t-shirt first? Because the way the shirt is constructed required that I cut the side seams and shoulder seams, trim and lower the front. So once I had that lined up with the back, the nicely shaped fitting I had done was now off kilter and confusing as heck. It didn't matter in the end, but it made my life more difficult. 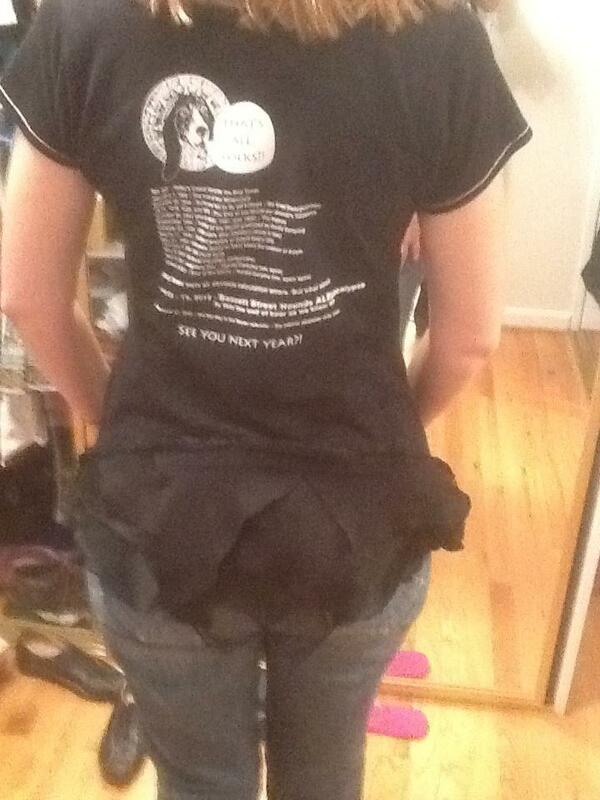 So my advice is to fit the t-shirt last, if it needs it. I followed the pattern instructions and used the front and back pattern pieces to get a sense of how they should line up. 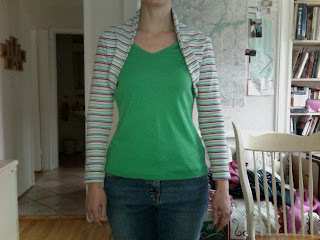 I used the yoke pattern on a grey t-shirt that I had attempted to reconstruct into a bolero jacket without using a pattern. I hadn't been successful with that and I may post my attempts because I took lots of photos. I ended up abandoning that project. No matter, I had the material available to use for this one. The yoke pattern piece is interesting geometry and I highly recommend Simplicity pattern 2364 if you can find it for cheap. I would not have figured out this shape - I know because it was what I was going for with the abandoned bolero shrug project. The yoke piece is assembled and folded in half. I didn't have enough material for that so I copied the pattern piece onto heartier paper and played with the shape by folding it different ways and ended up using it folded in a different way than the pattern calss for. The drape was single thickness rather than double, which is what it would have been had I used the pattern piece as the pattern intended. I'm sure I lost some body in the drape because of it but I did what was expedient. 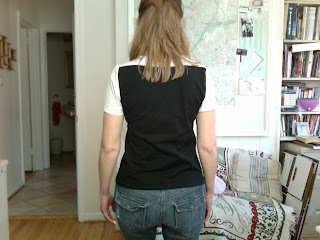 I used the sleeve pattern for the sleeve cap but was able to use the original t-shirt sleeve hem. I played around with this quite a bit. The pattern for the Simplicity top creates a bit of a front drape and I didn't want the front of the top (the black part) to drape but to be as flat as possible so I had to do some tweaking. Ideally, I would have taken all of this into account before I sewed and would have cut the front properly, but no, I sewed and pinned and tried on and ripped seams and sewed and pinned again. I am pleased with the result. I think I may even use the Simplicity pattern to make the top from scratch some day. I've been intrigued with steam punk for awhile and especially fond of the small and mini top hats that are often part of the look. When I was at the Maryland Renaissance Festival last fall, I bought one at The Tall Toad. I was in garb and in a festive mood and had some birthday cash to spend so I bought a simple small top hat for $70. When I would wear it, I had no clue but figured I'd never wear it if I didn't buy it. 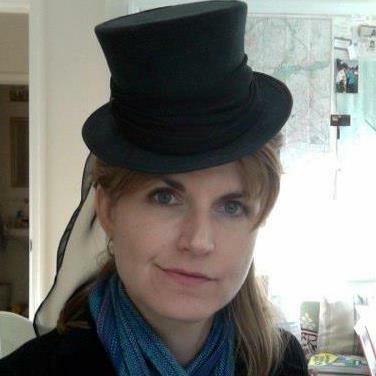 Or rather, when I had reason to wear a mini top hat, it would be sad not to have one. 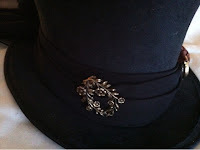 Though I had pinned mini top hat tutorials, I doubted I would ever make one or that if I did, that it would turn out well. Love it and oh, the possibilities. 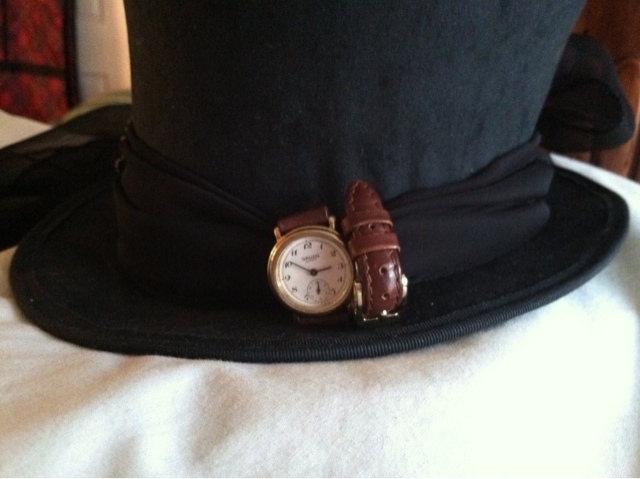 The first time I wore it, with my steam punk Halloween costume, I made a hat band and rosette and added a cameo (will write a post for that later). Months later, I was invited to a steam punk tea party and thought I'd change my look a bit. 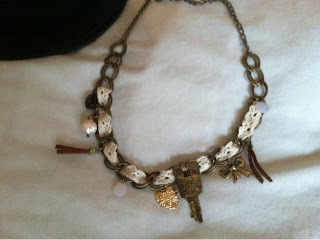 I had purchased a necklace for a few dollars at Delia's when they were having a sale. With the lace and various items, I thought it looked steampunky. I ended up sewing an old looking key in a bare area. I draped the necklace over the sheer black hat band but I worried it would sink down and not be visible. 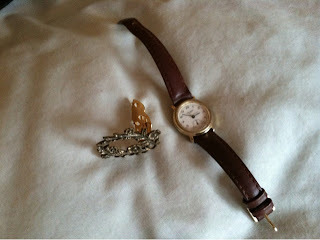 Looking through my collection of curious treasures, I found a single flowered shoe clip (its mate long gone) and a Gruen watch. Both were my grandmother's. I put the shoe clip on one side, and wrapped the watchband around the other side and those provided the lift the necklace needed to keep it from sinking down to the brim. 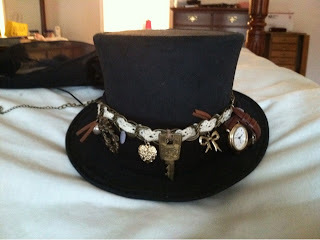 I simply fastened the necklace at the back of the hat. I intend to write posts about how I put together this look. 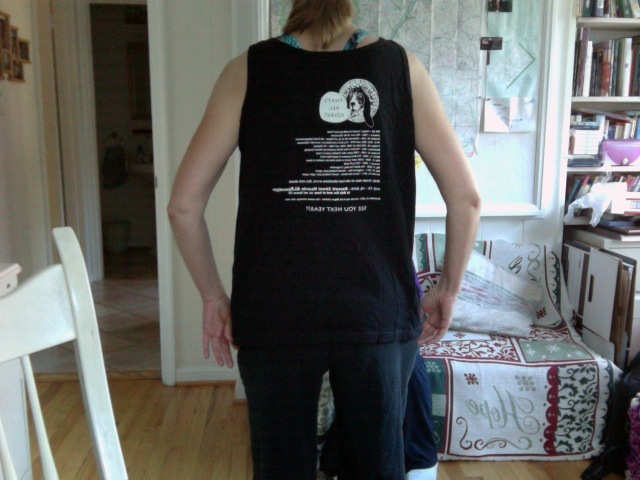 This t-shirt is special to me because it's my first morris ale t-shirt, but it was shapeless and baggy and maybe I didn't really want a tank top anyway. I love Pinterest and have been pinning t-shirt recons like crazy. I finally got up the nerve to use them. This post isn't a tutorial because there are so many wonderful tutorials already on the internet. This post is just to show how I combined them to create a top that I love! First, I altered this baggy t-shirt into shape based on a tutorial that suggested using a well-fitting shirt as a pattern and tracing it onto the bigger shirt. After tracing, I sewed it up, checked the fit and then cut off the excess. I even pressed open the seams. Since I was dealing with a tank top, sleeves were not an issue. Then, I decided to add a bustle back to this t - I love this tutorial, love her attitude, love the sound of her voice, I've watched it many times. For my bustle, I used scraps from a failed recon of a black t-shirt as well as satin and sheer bits I used in my bustle project (which I've yet to write up and post). I love that synthetic material does not need to be hemmed to avoid fraying but can be melted using a lighter. I had so much fun watching the ends curl up and I figured it would add an interesting texture to the bustle. I thought about adding some velvet bits because I think that would have been awesome, but I didn't feel like hemming it and worried it would shed. Finally, I decided that I really wanted to add sleeves to this. I debated whether to add long sleeves or short and very nearly added long velour sleeves from an unloved zip jacket that was given to me. I decided velour would make it too cold-weather seasonal and decided to stick with jersey. I had a failed recon that I figured I'd use for scrap and decided to use its sleeves. 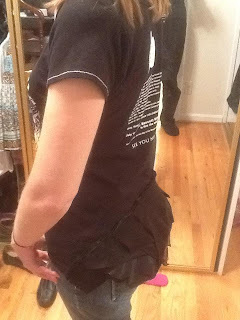 I picked out the ribbing on the armscye and added the sleeves just by pinning them in place and sewing -- it was pretty easy, even for a novice like me.